MCX Gold futures are trading slightly lower in the early moves on Saturday as lack of global cues keep the activity restrained. The COMEX Gold futures ended slightly higher on Friday, as better-than-expected U.S. jobs data boosted investors` willingness to move into riskier assets, including stocks and commodities. Gold for April delivery ended up by $2.10, or 0.2%, to $1,135.20 an ounce. The dollar turned lower versus the euro in midday trading after Greece`s parliament approved the proposed austerity measures. US. Nonfarm Payrolls employment data released today showed that jobs fell in the month of February by less than expected while January`s jobs data was revised slightly higher. The Department of Labor nonfarm payrolls report showed that employment fell by 36,000 workers in February to total of 14.9 million unemployed workers following January`s revised job loss of 26,000 workers. The US equities were in an upbeat mode yesterday. Organisation for Economic Co-operation and Development said its composite leading indicator continued to signal an improvement in economic activity for the G7 countries. The CLI for the OECD area increased to 103.6 in January from 102.8 in December suggesting expansion. The measure for the euro area increased moderately to 104.8 from 104.2. The CLI for the U.S. climbed to 102.3 from 101.4. MCX Gold futures rallied above Rs 16900 but failed to record proportional gains as the Indian rupee ended around 45.60, recording its fourth consecutive weekly gain. 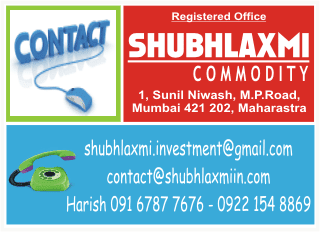 The MCX April futures ended at Rs 16901and slipped in the early moves today. The counter trades at Rs 16982, down Rs 9 from the previous close. The prices are likely to move in a very narrow range today with Rs 16970 likely to act as a decent support.